Two-thirds of all money spent on advertising in digital media in 2019 (65%) will be traded programmatically, according to Zenith’s Programmatic Marketing Forecasts. Advertisers will spend $84 billion programmatically next year -- projected to reach $98 billion in 2020, when 68% of digital media expenditure will be earmarked for programmatic trading. However, the transition is taking longer than Zenith expected, with last year's forecast projected to be 64% in 2018, and 67% in 2019. Analysts have pulled back both forecasts by two percentage points. Further, Zenith estimates that programmatic ad spend will grow 24% in 2018 -- down from 32% growth in 2017, and forecast to be only 19% in 2019, followed by 17% growth in 2020. This is due to the introduction of privacy legislation, such as the EU’s GDPR. It has had a "chilling effect," by making certain data previously used in programmatic transactions unavailable and making other data more costly to process, says Zenith. “But we think the main reason for the slowdown in spending on programmatic media is that advertisers are investing more in infrastructure and data to make their programmatic activity more effective,” states the report. The U.S. will continue to dominate the market -- accounting for 58% of ad spend, worth $40.6 billion in 2018. This figure grows to $47.5 billion in 2019 and $55 billion in 2020. China is in a distant second place, spending $7.9 billion on programmatic advertising in 2019, followed by the UK, with $5.6 billion. The U.S. is also the market that has most embraced programmatic advertising -- trading 83% of all digital media programmatically in 2019, worth $49.1 billion, followed by Canada (82%), the UK (76%) and Denmark (75%). 2 comments about "Zenith: Programmatic Approaches Two-Thirds Of Digital, Begins To Flatten". Carl Spaulding from Nielsen Catalina Solutions, November 19, 2018 at 11:42 a.m.
"Two-thirds of all money spent on advertising in digital media in 2019 (65%) will be traded programmatically, according to Zenith’s Programmatic Marketing Forecasts. 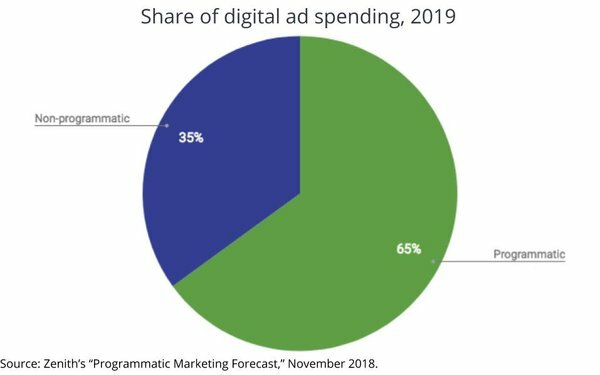 Advertisers will spend $84 billion programmatically next year --"
"The U.S. is also the market that has most embraced programmatic advertising -- trading 83% of all digital media programmatically in 2019, worth $49.1 billion, "
How do you reconcile these seemingly contradictory statements? Larissa Faw from Mediapost, November 19, 2018 at 12:18 p.m. The first part refers to programmatic advertising expenditures while the latter is programmatic display advertising spend.